We Had So Much Fun at our 2018 Second Chances Luncheon! Thank you for joining us for our 2018 Second Chances Luncheon. We hope you enjoyed seeing the Cat Daddy, at behavior expert and television star Jackson Galaxy, in person and were as inspired as we were! We are celebrating our 30th anniversary this year and this is a very exciting time for Purrfect Pals! We recently completed construction of a brand new 4000 sq ft building at our Arlington sanctuary and our newly expanded facility will allow us to increase our capacity, improve services and provide even better care for the cats in our community and their families. We are very proud of all that has been accomplished during the past thirty years thanks to the support of cat lovers in our community like YOU. We are even more excited to see what we can accomplish together in the next thirty! To learn more about the Second Chances Luncheon or other special Purrfect Pals events, please contact our Community Engagement team at 360-926-8447 or luncheon@purrfectpals.org. 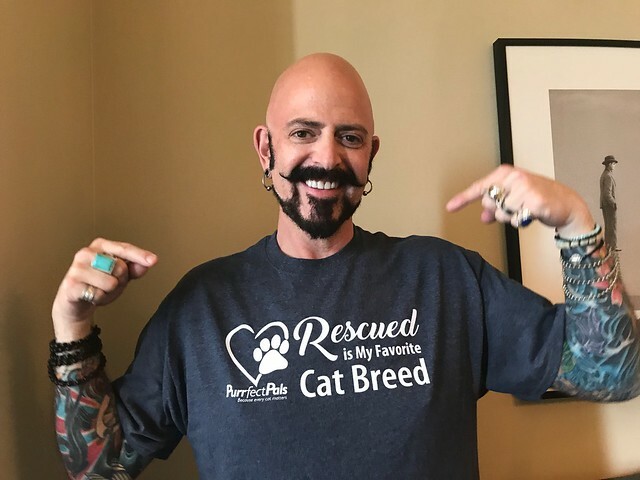 Meet Our 2018 Second Chances Keynote Speaker: Jackson Galaxy! Jackson Galaxy is the host and executive producer of Animal Planet’s long running hit show My Cat From Hell. Jackson, an animal advocate and cat behavior and wellness consultant, is also a two-time New York Times best-selling author with more than 25 years of experience working with cats and their guardians. Popularly known as the “Cat Daddy,” Jackson is on a mission to educate people about cats and deepen the human and cat bond, while reducing the number of animals that end up in shelters. Over time, Jackson has developed and honed his philosophy known as “Cat Mojo,” which teaches cat guardians the skills to help their feline friends build confidence within their environment. Jackson has written extensively about his work and philosophy in Cat Daddy, Catify to Satisfy and Catification. Jackson’s newest book, Total Cat Mojo, hit shelves on October 31st. His new series,Cat Vs Dog, premiered on Animal Planet on Saturday, November 11th. For more information, please visit www.jacksongalaxy.com and stay up-to-date with Jackson on YouTube and Facebook. Meet Our 2018 Second Chances Luncheon Sponsors!